We recently had a birthday party for the baby. Just a small get together for some close friends and kids (4 kids total although all 8 of us are young at heart.) My husband, being the smart man that he is, suggested that we order some pizza and keep things simple. Simple is not my middle name, but I thought about it and saw the logic. I did however add a couple easy items to the table to create some healthy and flavorful options for all to enjoy. We ordered pizzas from Joe’s Pizza (guys are from Brooklyn and you can tell!) I added to the table a big pitcher of Sherley Temples, Cesar salad, cheese bread, garlic bread and pea pesto. The pea pesto is a go to favorite of mine because it is easy as pie (birthday cake in this instance) and sooooo good! Throw the following items in your food processor : 10 ounces of frozen peas (defrosted), 1 clove garlic, 1/2 cup grated Parmesan, 1 tsp salt and some fresh pepper. 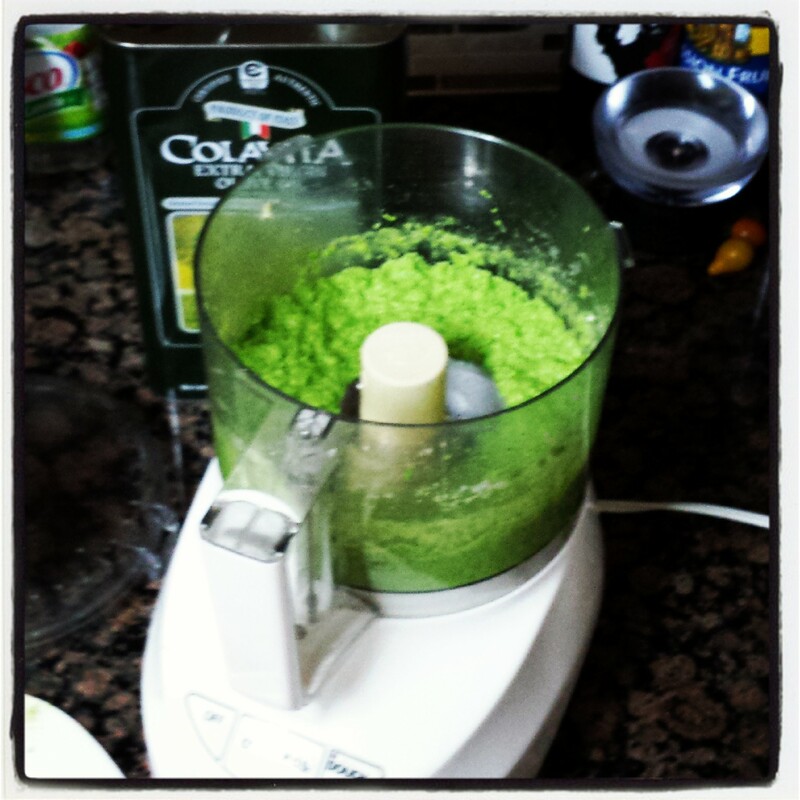 Turn on food processor and slowly pour in 1/3 cup of olive oil and then continue to run the food processor until the pesto hits a texture that looks good to you. I like it just a little lumpy. Put in a bowl and stick it in the fridge before you find yourself eating it all. That is it. You are already to go! Categories: Good food | Tags: Easy party food, Pea, Pesto, Pizza dinner sides | Permalink.